The Filthy 5k-ish Mud Run kicks off Dominion Energy Riverrock with some down and dirty fun. It’s not just a trail run with rugged terrain – as if the roots, rocks, and uneven ground aren’t tough enough! Be prepared to trudge through the James River, rock hop across the dry way, and climb, crawl, and leap over other natural obstacles along the course. There may be an ice cold beer awaiting you (if you’re 21, of course), but first you have to crawl through a massive mud pit at the finish line! As if the Filthy 5K-ish was not enough fun, you can get your dog into the mud too! Sign up for the Dog Wave, a part of the Filthy 5K-ish, and bring your favorite canine through the trails, along the dry way, across the river, and into the mud pit. There’s no better way to spend a Friday night than with man’s best friend! Enjoy more dirt and less pavement! 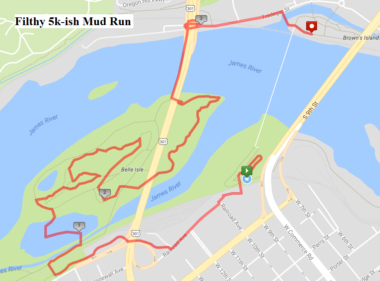 The Filthy 5k-ish Mud Run will start on the south side of the river, just over the T. Tyler Potterfield Memorial Bridge, and end on Brown’s Island with a crawl through the mud pit. Participants in the Dog Wave must be at least 16 years old to run with a dog. The Filthy 5k-ish Mud Run utilizes wave starts in order to control volume on the trails, so you will be asked to line up for the start based on your predicted pace.